Like many university students, Kesey Daye spent her summer working. But Ms. Daye, unlike many of her peers, wasn’t working a run of the mill summer job; she was putting her studies into practice by participating in a summer internship with J.D. 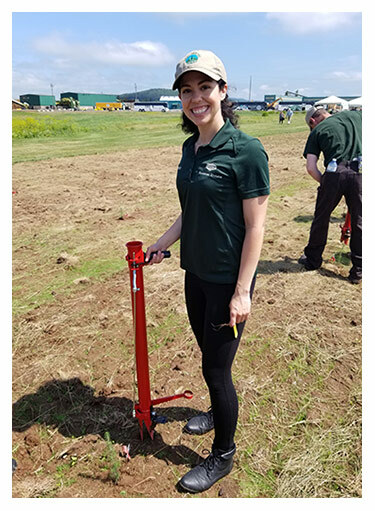 Irving, Ltd.
For four months, Ms. Daye, a recent recreation and sport studies (BRSS) graduate, worked in the company’s Woodlands Division as one of two ergonomic and kinesiology students hired to work with the tree planting crews. “Our main objective was to reduce the tree planters’ risk of developing musculoskeletal injuries,” says Ms. Daye, who is from North Sydney, N.S. Ms. Daye created educational materials, like a tree planting orientation manual for new planters and technique and equipment reference cards for the crew chief, so they knew what to look for when coaching their planters. Using critical reasoning, she realized that her role could be more effective if she trained the tree planting crew chief to coach the tree planters, since she was on-site just twice per week. Greg Duquette, assistant dean of undergraduate programs and experiential learning coordinator for the faculty of kinesiology, says the faculty promotes a multi-disciplinary approached to studying physical activity, wellness and health. “Kesey’s ability to apply a diversity of knowledge into a corporate employee wellness setting is both a testament to her exceptional skills and to our pedagogy that facilitates opportunities for experiential learning,” says Mr. Duquette. Ms. Daye also credits her on-site mentor, an occupational therapist, for encouraging her along the way. While Ms. Daye had always envisioned herself working in a clinical setting, her exposure to working with tree planters and sawmill laborers in the field taught her to keep an open mind. Now that she has graduated, Ms. Daye plans on getting her master of science degree in occupational therapy, and to become a certified occupational therapist. Photo: Recent kinesiology graduate Kesey Daye spent her summer internship developing an orientation manual for new tree planters with J.D. Irving, Ltd. Credit: Celine Heppel, J.D. Irving, Ltd.